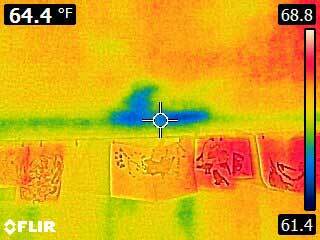 Boulder Home Inspector provides quality Home Inspections, Radon Testing and Infrared Thermography. Our inspections visually observe, document and report safety issues, material items, maintenance and recommended repair items. We look forward to providing you with exceptional customer service before, during and after your inspection. Whether you are buying or selling a home, remodeling an existing home or just want to know the overall state of your property our inspection services will provide details about each component of the property. Having a certified home inspection will give you the piece of mind you need while making that house your Home. It can also be used as a starter guide to owning your new home, by pointing out areas to focus on to keep your new investment looking and performing well for years to come. Home inspections can also be used by homeowners to review the house with a pre-sale home inspection to reduce lengthy closing negotiations when under contract. This system is used everyday for the life of the house that if not installed or maintained properly, can cause a homeowner a lot of frustration. Main water supply shut-off valve, fuel supply shut-off valve, water heating equipment, interior water supply to fixtures and faucets, toilet operation, sinks, tubs, showers, drain waste and vent system, accessible drainage sump pumps. Another system that is used daily for the life of the home that can be the cause of material damage. Service drop, overhead service conductors, service head, gooseneck/drip loops, service mast, service conduit and raceway, electric meter and base, service entrance conductors, main service disconnect, panel boards, circuit breakers, fuses, service grounding, bonding, number of switches, AFCI, GFCI, smoke detectors, carbon-monoxide detectors. Unfinished spaces, attics, crawlspaces, foundations. If accessible/visible – insulation in attics, crawlspaces, foundations and unfinished spaces. If accessible/visible – ventilation of attics, crawlspaces, foundations and unfinished spaces. Often a nice addition to any home, a fireplace can be an overlooked material issue when purchasing a home. Operating damper doors (if accessible and operable), clean-out doors and frames, visible portions of the fireplace and chimneys. We invite you to walk the property with us to identify areas of interest. Evaluation of vegetation, positive and negative surface drainage and grading issues, porches, patios, decks, balconies, carports, stairs, stoops, ramps, walkways, driveways, flashing, trim, exterior doors, wall coverings, eaves, soffits, fascia, windows. Often one of the first things to see when looking at a property, but from a far can be decieving. Roof-covering materials, gutters, downspouts, vents, flashing, skylights, chimneys, roof penetrations, access panel accessibility, doors, stairs, indications of leaks. If accessible – foundation, basement, crawlspace. Operating the heating (winter), cooling (summer) systems that are currently operable, determining the source and heating methods. 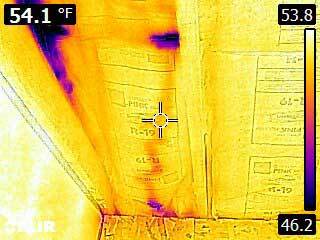 Bring your home inspections to another level with an Infrared Inspection. 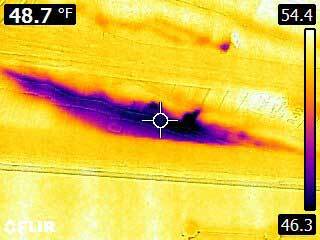 Using a camera that detects and visually displays temperature differences in/on materials allows the inspector to see additional information that would not be detected by the naked eye. If there is a temperature change anywhere in the room it will be detected and displayed with the range of temperatures it is composed of. 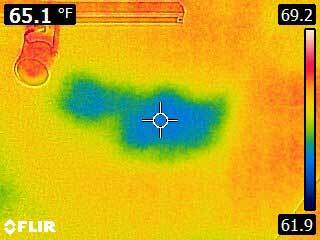 In the photos above you can see the areas that are showing a leaking roof and how the water is being dispersed over the ceiling and wall areas below. We offer three services that allow you to select the level of inspection you prefer, so you can have peace of my mind about buying the home you love. Your custom report will show detailed images and descriptions of key areas of concern, safety items and point out specific problem areas. We also work with Sewer Scoping Companies so if your looking to have that done all at once we can schedule and coordinate with them. Write a review on our website. The inspector arrived on time and went about his business in a very professional manner. I received a thorough report on our very nice and really complicated home. Totally satisfied. I found Boulder Home Inspector to be very professional. They communicated well leading up to the inspection. They arrived on time to start the inspection. They were considerate in asking permission before inspecting something or entered a space. They finished without a trace left behind. The report they generated was top notch. They have a very professional website with all the details of the inspection and you can download the report from there. It’s very thorough and easy to read. I’d highly recommend them for home inspections. Boulder home inspector scheduled a convenient time between my husband and my crazy schedules. They did a thorough examination of all parts of mechanical and structural that they could access. When done they walked us through the house and explained what they had seen in each area giving suggestion if needed in an area that could use an upgrade or maintenance to improve the property value and our family’s safety. Our inspection report contained all that they had found and offered the possible action items for each section(that I might not have remembered after a whole house walk through) in clear easy to understand language. Thank you – two thumbs up. I couldn’t recommend Brett more highly. He was extremely thorough and knowledgeable. I learned more about my house from the short time that Brett spent in my house than I have in the 10+ years that I’ve lived there! His suggestions were practical and took into account both the ideal and realistic state of possible solutions. He also distinguished between safety and “best bang for your buck” fixes, which I highly appreciated. He was very professional and conscientious (leave no trace). I also appreciated the very complete and accessible inspection report that Brett made available within a day of his inspection. Great service! This company knocked it out of the park! Incredibly knowledgeable and professional. Brett came out to do a radon test for us after a home remodel. He answered all our questions, performed the tests needed and provided us with a report that had metrics every hour (48) over two days. Super interesting to see how temperature and other factors contribute to radon levels. Great technology! Unfortunately I need to do a mitigation, and Brett has made some great referral and suggestions for that too. !st class operation! Highly recommended. I almost never write reviews, but felt compelled because of our great experience. Thanks Boulder Home Inspector! Professional, courteous and responsive. I highly recommend this building inspector. Great price too! I highly recommend Boulder Home Inspectors. We’ve used Brett for home inspection and radon testing in the past and Brett was on time, knowledgeable, professional and very honest. Plus he gave us advice on other home tips. Thank you, Brett and Boulder Home Inspectors! I hired Brett to inspect a very large house with some known issues. He was easy to schedule, prompt and professional. The best part though, was his attention to detail and leaving no stone unturned. I have worked with inspectors in the past that walk through the house and shine a flashlight a bit finding nothing more than I already knew. Brett dug in and did a great job. Top notch report software, too. Thanks, Brett! Brett was invaluable during our inspection for potential water damage hidden within our walls caused by a tile contractor during our bathroom remodel. He provided additional insight in our home in addition to the primary task we had hired him for. Very well recommended. Write a review on Google. Residential Home Inspections in Boulder, Louisville, Lafayette, Superior, Longmont, Niwot, Gunbarrel, Loveland, Broomfield, Westminster, Erie, Golden, and Colorado Front Range.